It doesn't feel like spring! And I'm not Julie Andrews. The calendar says it's spring and I'm going with that. Even though Old Man Winter keeps hanging around, the trees are starting to bloom and the birds are singing. I've got happy feet and it's not just because of those Mizunos! For today's post, I wanted to share some of the things that keep me running happily. Because even though you can't fool Mother Nature, you can pretend it's warm and that's what I'm doing to do. InknBurn: It goes without saying that this brightly colored gear warms my heart! The designs are unique and produced in limited quantities. Made in the USA, Inknburn is such high-quality gear that there is a waiting list for the most popular previously worn pieces! As an ambassador, I have access to upcoming designs and let me just say that they've got some really great pieces coming out for summer, so it better warm up! Tailwind Nutrition: While I am no longer am an ambassador for Tailwind, I continue to run with their fuel. Tailwind is clean fuel and free of any additives that can upset sensitive tummies. Ahem. Tailwind comes in a variety of flavors as well as a few that are caffeinated. Tailwind recently released a recovery formula. Pjuractive Anti-Chafing Gel: I received a sample of Pjuractive a few months ago and I love this clear silicone gel. The gel goes on smooth and I haven't experienced any of the epic chafing that I'm known for. I'm looking forward to warmer days so I can really put this stuff to the test. Mizuno Wave Riders: I continue to love these light trainers. Wearing the Mizunos, I've been running some of my fastest times in a couple of years. The only issue I've had is a little rolling in of my ankles. Fallen arches? I'm currently trialing the Mizuno Wave Inspires to see if they will give me that support I need while still making me fly. Stay tuned. Portapotties: Hello, lovers! A sure sign of spring is the reappearance of the portapotties on the trails. I feel secure knowing they're out there. GLG Collagen Hydrolysate: This stuff has been a game changer for me, as far as my tummy issues are concerned. Initially, I thought it was just a fluke, but after 6 weeks of using GLG, I continue to have minimal tummy issues. So maybe I won't be needing those portapotties after all. A runner can hope. 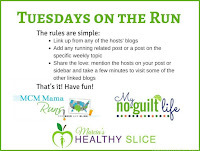 Let Your Mind Run by Deena Kastor: I'll be reviewing this wonderful book on April 20, but spoiler alert, I loved it! So will you. Deena is running the Boston Marathon this year and you know I'm cheering for her. She's an amazing person and after reading her book, it's no surprise that she's been so successful on the road. TrekzTitanium: I've been wearing the AfterShokz model ever since I road tested them last year. These unique headphones sit in front of your ears, providing sound via bone conduction while allowing ambient noise in. This keeps you aware while still running to your tunes. The sound quality is surprisingly very good! The company listened to us and came out with a new model, the Trekz Air, which is lighter and less bulky. Garmin Forerunner 230: I'm a data junkie, and the Garmin Forerunner 230 gives me all the information I need and then some! Yep, Garmin makes fancier models with more bells and whistles, but with the 230, there is more functionality to this model than I'll ever need. My favorite feature is the programmable intervals, which has been a run saver for me. It's easy to operate. If you want the heart rate feature, the 235 has you covered. Knuckle Lights: I recently did a review on these, and I just love them for those early morning runs! They fit unobtrusively over my loosely fisted hands and the LED light casts a wide path for me to follow. There is a rechargeable model as well. SpiBelt: I bought my first SpiBelt at the WDW Marathon expo 7 years ago and I thought it was just about the best running accessory ever. I still do. Big enough to hold my iPhone 7 as well as a pack of Tailwind, I never leave home without my SpiBelt. 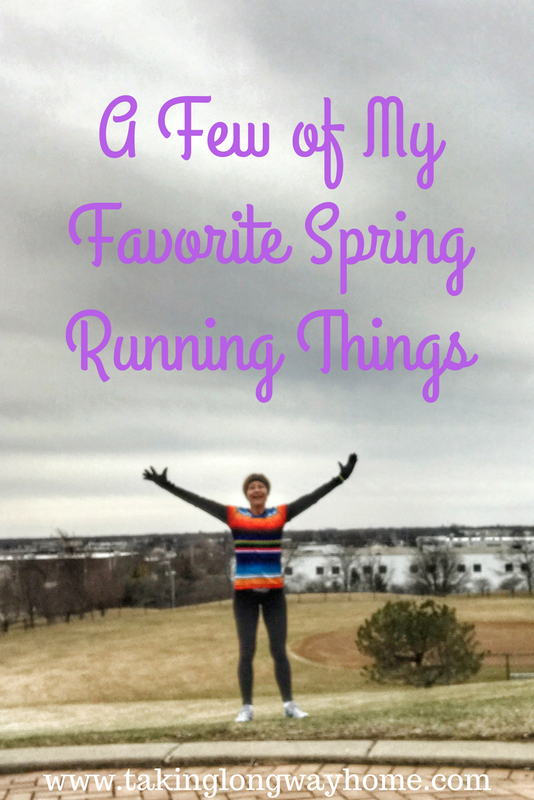 These are my favorite running accessories! What are some of yours? 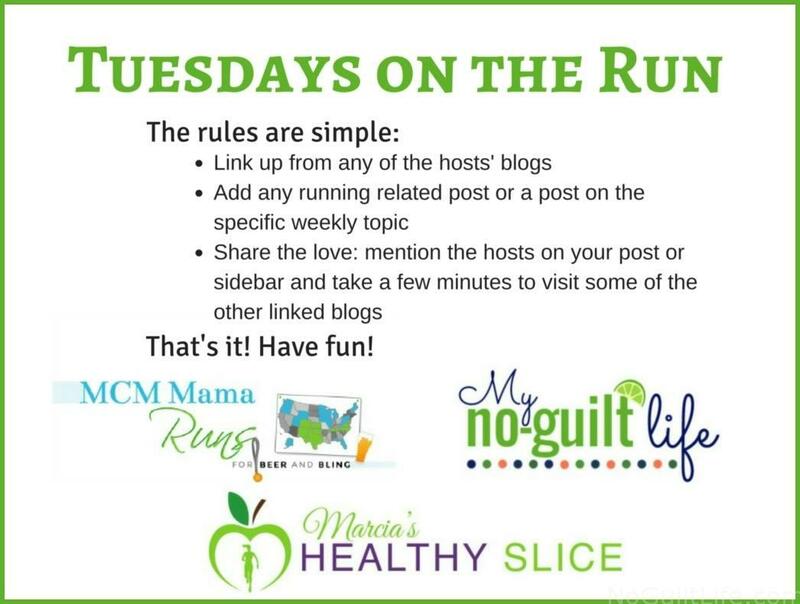 I'm linking up with Marcia, Erika, and Patti for Tuesdays on the Run and Debbie, Rachel, and Lora for Running Coaches Corner. I love my Oiselle lightening layer, my headlamp, and my Brooks Launch. I’ve heard of the ant-chafing gel as well but for now haven’t had the need for it. This reminds me that I haven't seen my Spibelt in quite some time. Hopefully it's somewhere deep in the abyss. I need the smaller version of Trekz! Mine slip down when I wear a headband. I have still not tried the ink burn tops or shorts but you look so cute in them. Perhaps I need a wardrobe update!? How is the sizing? Where should I start? I want to like the Tailwind but I find it very salty. I think the Inknburn sizing is pretty true to size. If you like your tops loose, I'd size up. Same with the running shorts. Skirtsports, of course! I like the Wave Riders. So far I don't need support & run in neutral shoes. I never needed support before, or so I thought! The Newtons are definitely an acquired taste. As you know I love Tailwind too. I'm looking forward to trying their recovery formula. All of those Ink Burn items are awesome! I just love all the bright colors. I do love the bright colors, especially the way the weather has been lately! Tailwind is my go to sport drink on the bike! It basically saved my stomach last year from tri season - I was having so many nutritional issues, I don't know if I would of been able to continue to do longer distance triathlon. Tailwind has saved me many a run! it isn't perfect, but it's probably the best I can find. I have been running off and on with music for 8 years, and have the same pair of corded ear buds that sit outside of the ear. Needless to say, I'm ready to move forward and was looking at those Trekz headphones after Christmas...glad to hear you like them as they might just go on my birthday wish list! I need to buy a pair of Knuckle Lights. Other than shoes, I haven't bought any new running gear in several years - time to remedy that, don't you think? Pretty sure you need to buy the Trekz headphones and the Knuckle Lights! I need to read that book. I <3 Deena Kastor! Maybe next month after this one class finishes and I have a little break before the next one starts up. Grad school can really be a beast sometimes! Been there, done that! Let me know if you get a chance to read the book! I LOVE my Trekz Titanium headphones (how did I ever run with wired headphones again?) and my Garmin 235. I have a sample of that antichafing stuff but haven't tried it out yet-looks like I should. I also love my Lily Trotters compression socks-they're cute, comfortable, and easy to get on/off. Oh, Lily Trotters! Yes! I do love them! Can’t live without my spibelt. Love skisports of course and my Nikes. I'd have to say that my SpiBelt is the one thing I can't live without! I love my 230 Garmin. I don't track my HR so didn't need the 235. They're so easy to learn, and I love all the stuff it stores. Maybe you should just concentrate the Tailwind more so it doesn't have as much water? Im really temped to try the trekz air! The regular ones were just too big for me and I've sort of given up looking for wireless headphones. Also, I will need to add that book to my list for this year! I like that Trekz changed the headphones based on feedback from users! I continue to be happy running in Mizunos! I'm glad you found the inspires as they are more of a support shoe, right? My spi belt is one of the first running accessories I ever got and I still love it. I'm liking the flip belt too as I can fit a little more in it and it fits more snugly. I think most of us would agree that the SpiBelt is pretty great! I'm wearing the Cherry Blossoms just hoping it will inspire Mother Nature to send us some spring vibes instead of the snow we woke up to this morning! I've always been super on the fence about collagen products because I don't feel like they do much of anything... BUT, if you say it's a GAME CHANGER - then I may really have to take a closer look! Anything that keeps me out of the portapotty...or the woods is a game changer. Just sayin'. What a great list! I do love my wave riders too! It's like they have wings! I love my Spibelt and my Garmin. I just heard of tailwind but haven't had a chance to try them. I will be adding Deena Kastor's book to my kindle for the future. Thanks. Let me know what you think! And if you want me to send you some Tailwind, pm me. I really need to hop on the Tailwind train. I've heard great things and as the temps creep up here in Houston, hydration will be a MUST! Anything that sits well on sensitive tummies is a must try for me! Let me know if you want me to send you some Tailwind--pm me! I've heard a lot of good things about the Flipbelt! My love of the Wave Rider goes back to about version 14. Now we're on 21 and I still love them. Also love my Garmin 235! Other things I don't run without include Nuun, Pro Compression socks, and my Skirt Sport skirts! They have all the pockets that usually carry all that I need, even for a longer run. Pockets are a must! It's why I love my INB skirts and shorts! I pretty much am never out there without my procompression socks (and I'm not an ambassador), one of my many buffs, my garmin (either my 235 or my new vivo), my pink phone pouch (not spibelt, not sure which brand...) or my salomon hydration pack. I too am often in a brightly colored Inknburn top (and I'm not an ambassador) - recently bought one that was screaming my name to be purchased :) My hydration is usually High5 or SIS. i'm in the market for new headphones and am going to check out the Trekz! Portapotties are however, never under a list of "favorites" hahaha! Oh gosh, you have to love a portapotty when you need one! You are so funny pointing out the portapotty. You are a very honest blogger. I hope you will get some real spring weather soon. Arm warmers are my favorite spring running accessories. Easy temperature control, but they also make convenient tissues....because allergy season. I don't use arm warmers a lot, but when I do, they are my husbands old socks that I can cut off the toes and slide over my arms. Ohh I am loving this list! I am going to have to check out a few of the items I have yet to try. I also received some of the anti chafing gel and I can't wait to really use it! Love the Trekz Titanium, and my Garmin 735. I would also like to add my ArmPocket and my Goodr sunglasses. If you haven't tried those, you are missing out! 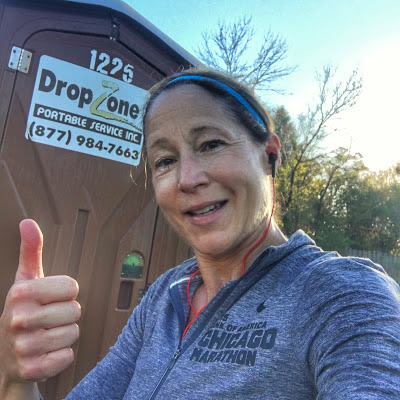 I also love my Garmin 230, SPIbelt, and finding a porta potty when I need it! I'm loving my Apple AirPods, too! Please tell me about the Collagen Hydrolysate. Did you start using it for your RA related joint issues and just happen to discover that your tummy issues disappeared? I'm wondering if I should give it a try.